I think this happens every time I take our son with me into a public restroom. So far he hasn't gotten the door further than unlocking it but I am just waiting for that day at Starbucks where he opens the door to flash me stumbling after him in a very un-presentable state for the whole room full of coffee sipping customers. 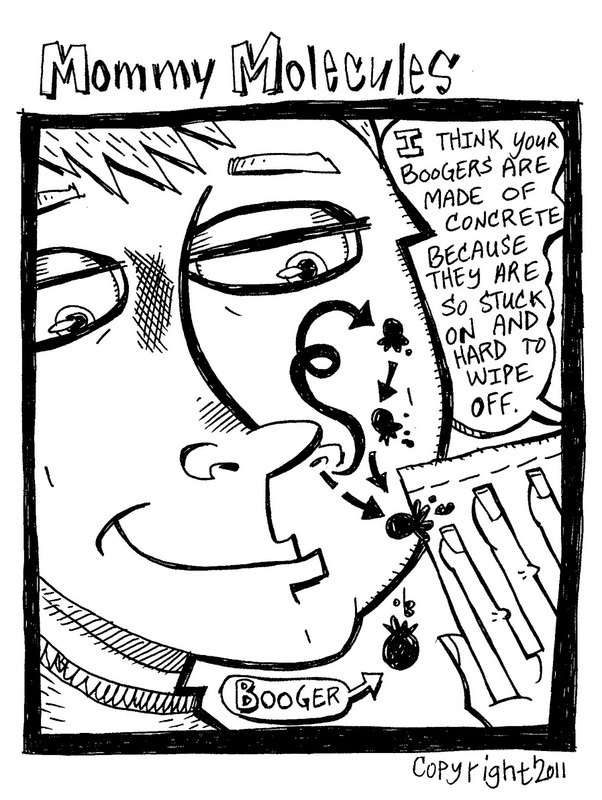 Every once in a while our son gets a booger that just seems to jump around his face every time I try to wipe it off. I always just try to snag it before he loses complete patience and ends up running around with the little thing stuck on for good! 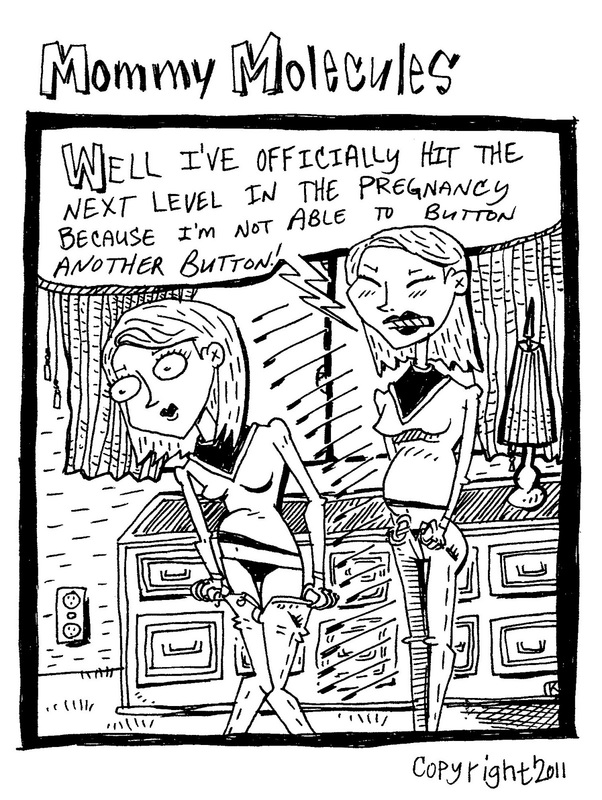 Web Comic: Pregnant lady in her underwear? 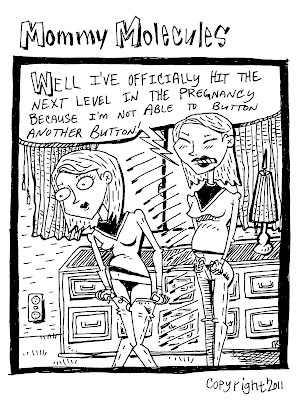 And yes, this is a comic of a pregnant lady in her underwear. 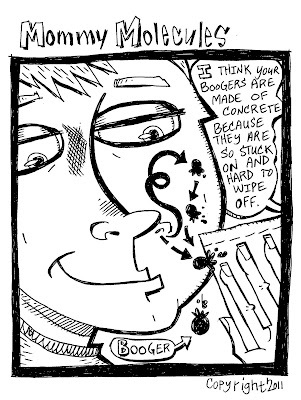 I am not going to admit to it being me, I didn't even know Ken was going to draw this one. I guess this is his perspective on seeing me, I mean ladies, dealing with the changes their bodies undergo during pregnancy. Although, I will admit I can only fit into one of my pairs of jeans with the zipper even halfway up and the button held together with a pony-tail holder. It really is that point when you have to admit that you have to consider other clothing options, although I still haven't bought any official "maternity clothes." I did buy a couple of pairs of cargo pants with a stretchy waist. I plan to spend the spring in skirts, that seems to work best and I won't mourn the money spent on clothes that I can only wear for a short while. Or maybe I am just a stubborn red head. That is probably it.